Provides an indication of the tendency of gasoline and aviation fuels to form gum in storage. The sample is oxidized inside a stainless steel pressure vessel initially charged with oxygen at 100psi (689kPa) and heated in a solid block bath. The amount of time required for a specified drop in pressure (gasoline) or the amount of gum and precipitate formed after a specific aging period (aviation fuels) is determined. 4-vessel insulated aluminum block bath. Baths feature microprocessor temperature control with built-in overtemperature protection and dual LED displays for the setpoint and actual values in °C/°F format. The solid block design offers operating advantages over the boiling water baht, and meets temperature contrl and other requirements of ASTM and related methods. It should be noted, however, that many applicable specifications for this test method call for a liquid bath medium. Housed in an insulated steel cabinet with chemical-resistant polyurethane enamel finish. Includes lids for pressure vessel ports. Order thermometer separately. Insulated aluminum block baths available in two or four-unit capacity. Baths feature microprocessor temperature control with built-in overtemperature protection and dual LED displays for setpoint and actual temperature values in °C/°F format. The solid block design offers operating advantages over the boiling water bath, and meets temperature control and other requirements of ASTM and related methods. It should be noted, however, that many applicable specifications for this test method call for a liquid bath medium. Housed in an insulated steel cabinet with chemical-resistant polyurethane enamel finish. Includes lids for pressure vessel ports. Order thermometer separately. K10510 Replacement composition gasket for K10500 Oxidation Pressure Vessel. K10551 Pressure Line - For pressurizing Oxidation Pressure Vessel. 6 ft. (1.83m) long, with quick release coupling for needle valve on pressure vessel and threaded fitting for oxygen tank. 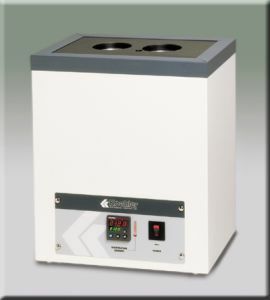 K10556 Oxygen Manifold Pressure Relief System - Connects to oxygen source to prevent overcharging of vessel. Equipped with relief valve to vent at 125psi and 300 series stainless steel 150psi burst disk assembly. Constructed from 300 series stainless steel. Cleaned for oxygen service. K10520 Wrench For tightening seal on Oxidation Pressure Vessel. K10530 Table Socket - Installs in benchtop to aid in tightening seal on Oxidation Pressure Vessel. K10560 Bronze Tubing - For connecting pressure recorder to vessel. Flexible seamless helical tubing with protective armor braid and connections. 5 ft (1.52m) long. K10525 Burst Disk Assembly - Retrofit kit for Oxidation Pressure Vessel without burst disk assembly. Solid block baths meet temperature control and other requirements of ASTM and related methods. While the aluminum block design offers operating advantages over the standard boiling water bath, it should be noted that many applicable specifications for this test call for a liquid bath medium. Please refer to the test method for the specific requirements.